I managed to reserve the clubhouse that my friend used for my baby shower, too. It’s great! It’s a big great room with a TV, sofa and seating area, 4 good sized square dining tables, and a full kitchen with a huge kitchen island. It makes the whole party flow so nicely and is easy to organize where everything goes. I made a sign for the outside and picked up some balloons to match. The sign was super easy, using my Cricut. I bought the Life is a Beach cartridge to make her invites and use for other miscellaneous items. It was so handy, and super cute! I will definitely be using it again for other fun stuff. I bought some wooden dowels and duct taped them to the back of the foam core board for the sign. It was easy, sturdy, and super inexpensive to make. I had a side table set up for her guest book, invite, pics of each baby (nicely labeled by her with notes on what you’re looking at, ha ha), and a picture of her since she couldn’t attend. I also used that picture for a game. The cake was also along this wall. I kept the design of the invites super simple because she needed a lot. 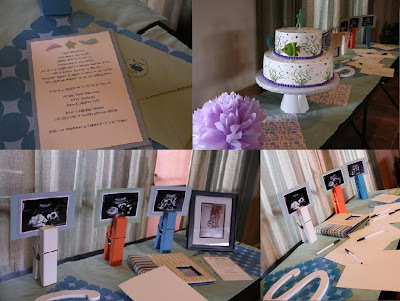 The giant clothes pins and guest book were bought at TJ Maxx. My personal shopper, aka Yvett, found them for a great deal and picked them up for me. She’s awesome! The “S” on the table is for the first letter of their last name, and I picked that up at Joann’s. I also picked up fabric to make the table runners from Joann’s. I cheated and used Stitch Witchery instead of sewing it, but it did the trick, was inexpensive, and looked great! The cake was awesome. I ordered the fish and starfish felt buddies from giftsdefine on etsy.com. She was awesome. I sent her the colors I was using for the shower and she matched the fish to them. They are so adorable! 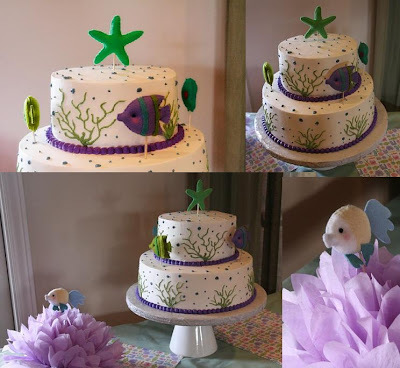 I also used the same fish for the centerpieces. I bought the pom poms from another etsy.com seller, Prost to the Host. She had a ton of colors, so finding some that matched was easy. I used the pom poms all around the room. They were great space fillers and added that punch of color and whimsy we needed. The centerpieces were easy peasy. I got the idea from Hostess with the Mostess, who did a Rubby Ducky themed baby shower. 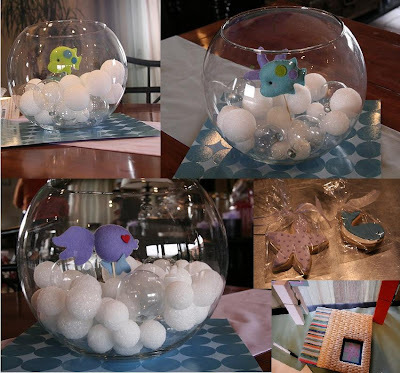 I picked up different sized styrofoam balls from Tall Mouse along with clear glass ornaments. It was handy to have the fish on skewers so I could puncture one of the styrofoam balls with the stick and the fish would stay in place. They turned out so cute. 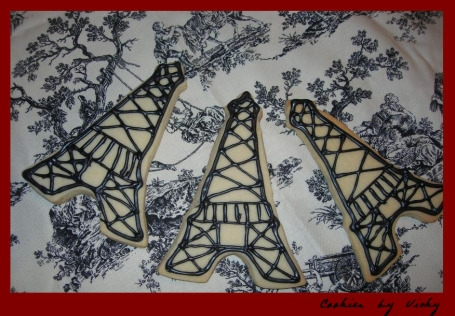 As favors for the guests, I ordered some cookies from Cookies by Vicky, who is a family friend. She did a great job, as usual! We made sure Jessica’s Hubby (who so thoughtfully came to the shower in her place and took video to show her) took the extras for Jessica and her nurses at the hospital. As for games, I concocted a few. Jessica had the idea of “Sea Babies”, where you match the gestation period with each animal pictured. We did a “Celebrity Babies”, where you match the celeb parents with their kids. My Hubby had the idea of doing a “History of Toys” game, where you match the old school toy with the year it came out. That was a tough one, but fun to make! I also picked up some of the multicolored goldfish crackers and filled up a vase. 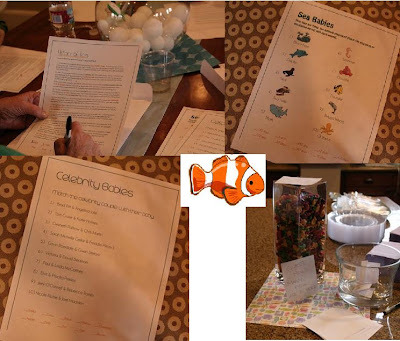 Guests put in their guess as to how many fish they thought were in there… 333 to be exact! Because there are 3 babies coming… And finally, I took the framed picture of Jessica and put it with some ribbon. Guests cut the ribbon to the length they thought would match what Jess’s belly size was. 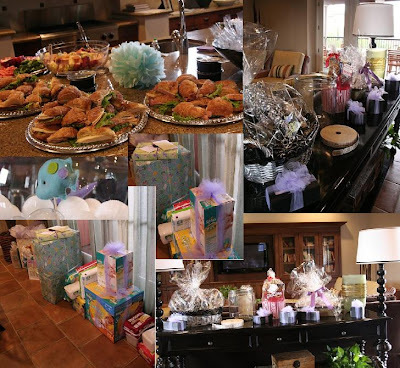 As for food and prizes, Jessica’s family and in-laws really helped out with that. We had yummy croissant sandwiches from Costco along with fruit and veggies with dip. I asked guests to bring diapers and/or wipes along with their gift so we could stock Jessica up before the munchkins arrive. Guests were entered into a raffle to win one of the fabulous baskets. There was an awesome wine basket with glasses, chocolate, and other tasty goodies. A spa basket and a movie basket. She made quite the haul of diapers, wipes, and gifts! Overall, I think the party was a big hit. It was fun to put my interior design and party planning hat on for a few months to put this whole thing together. It’s a nice change of pace from the usual grind of poopy diapers, messy high chairs, and running around. WEB and I got to get out of the house a lot to go pick up all of the supplies, which took a while since our trips were very spread out.